Asus Crosshair VI Hero owners, "brick fix" ROM is 0902 and newer, available in OP of Elmor's CH6 OC thread linked below. Also if using UEFI PState 0 OC with offset mode voltage for VCORE, disable Core Performance Boost, see this post plus spoiler below. If you OC as soon as CPU go out of base clock multiplier OC mode kick in and PB/XFR is disabled. i) AMD CBS pages is reset. ii) Extreme Tweaker is not reset. iii) CPU Core Voltage Offset mode. iv) CPB is [Auto/Enabled] on Extreme Tweaker. CPU will get excessive voltage. This is down to how CPU can use PB/XFR (even at boot/in UEFI) as CPB is on and as the CPU Core Voltage Offset did not reset on Extreme Tweaker = ~1.5V to CPU . So my advice if you OC DISABLE CPB manually in UEFI. - Ryzen Timings Checker v1.02 link added. No, that offset is available since build 3125 as a secondary sensor called "CPU (Tdie)", which is available only for CPUs that have the Tctl_offset (1700X, 1800X). What is shown as CPU Sensor under Asus Crosshair VI Hero is the Super IO Chip reading tCTL and displaying it. The Super IO chip CPU senor reading is used for cooling profile on C6H. The Super IO chip is ITE IT8655E. This thread's OP will just have essential Ryzen info which I have collected for my own purposes of "meddling" . The Ryzen data I have collected so far from owners, if you would like to be included please state IHS stamp info. As it will be interesting to see if newer batches improve on OC'ability or not. Elmor's SPD Tool, which allows checking of SPD data for corruption and restoring if you have file. Above is the official info on Ryzen 7 DDR4 support, any other config would be considered unofficial/OC. As the platform is so new currently, ROMs of mobos need to mature, so your achievable speeds will differ with higher spec DDR4 plus what #dimms/rank used/size GB. Next on the C6H is an option DRAM VBoot Voltage, why is this handy? This option is available because AMD is running their PSP and applying DRAM Ratio/timings before our BIOS code is able to execute. This means we can only apply higher voltage at that stage. If you boot from a fully powered off stage you'll get the default 1.2V until then. VBoot will tell our EC to apply higher voltage immediately at power on. Next AMD will be releasing an update in May, which will improve RAM options. Finally, as part of AMDs ongoing development of the new AM4 platform, AMD will increase support for overclocked memory configurations with higher memory multipliers. We intend to issue updates to motherboard partners in May that will enable them, on whatever products they choose, to support speeds higher than the current DDR4-3200 limit without refclk adjustments. AMD Ryzen™ processors already deliver great performance in prosumer, workstation, and gaming workloads, and this update will permit even more value and performance for enthusiasts who chose to run overclocked memory. The northbridge of Zeppelin is officially called as the data fabric (DF). The DF frequency is always linked to the operating frequency of the memory controller with a ratio of 1:2 (e.g. DDR4-2667 MEMCLK = 1333MHz DFICLK). This means that the memory speed will directly affect the data fabric performance as well. In some cases, it may appear that the performance of Zeppelin scales extremely well with the increased memory speed, however that is necessarily not the case. In many of these cases the abnormally good scaling is caused by the higher data fabric clock (DFICLK) resulting from the higher memory speed, rather than the increased performance of the memory itself. Extreme Tweaker/DRAM Timings will overwrite CBS menu items. There are two new settings under AMD CBS\UMC Common Options\DDR4 Common Options\ you might want to take a look at, Fail_CNT and ProcODT. Fail_CNT decides how many times to retry when DRAM training fails (F9 -> 0d), default is now 1. ProcODT can help improve your DRAM overclocking, 0079 relies on whatever Auto value AMD deems is best, 0081 has default value as 53.3 ohm. There's a setting available also on previous BIOSes under AMD CBS\UMC Common Options\DRAM Memory Mapping named BankGroupSwap. If you have 2x Single-Rank modules you can try setting this to Disabled and you might see some performance boost in certain applications. For anyone unfamiliar with ODT, it's a termination setting for signal integrity purposes. It's not going to affect performance (directly) or degrade your chip but it will affect your ability to run at higher clock speeds. Both DRAM and DRAM controllers (IMCs) have ODT (on-die termination) resistors that are configurable to a few different settings. Nominal ODT values are often set based on trace impedances, but other factors often come into play. I can imagine things like: number of DIMMs installed, DIMM PCB design, VDIMM and VTT voltages, etc all having an effect on which ODT setting works best. I would shy away from very high settings because the signal will overshoot/ring a lot and potentially cause problems. Suggested ProcODT values from Elmor/The Stilt. i) User sets ProcODT 80Ω, saves and mobo repost. ii) On repost if ProcODT is "wrong", training fail, AMD code detect this and revert to stock (ie [Auto]). iii) Mobo repost successfully, user views ProcODT and it is [Auto]. i) User sets ProcODT 60Ω, saves and mobo repost. ii) On repost if ProcODT is "right", training does not fail. iii) User views ProcODT and it is [60Ω]. All settings were same except ProcODT and "one off" test of increased SOC: 1.05V. So too low/high a setting of ProcODT = boot issue straight away. A setting within "optimal" range will "train" on post of mobo. User needs to do further stress testing for setting. User tests "setup" with HCI Memtest, there are errors. Users needs to retweak ProcODT. Reference link 1, link 2, link 3.
i) What is ProcODT? link 1, link 2.
ii) What is ProcODT value at [Auto]? UEFI prior to 0079 is what AMD code/training decide, after UEFI 0081 is 53.3Ω from reading Elmor's posts/build up of UEFI. UEFI 9943/9945 is what AMD code/training decide. ii) Why can I only select predefined ProcODT? link. iv) I'm still having issues once tuned ProcODT and passed HCI Memtest? link. Only my opinion, the caveat for this is still "we" have immaturity on platform in regard to firmware. So even if "voltages" are correct and ProcODT, "we" may still face some issues. Variables like RAM kit, IMC, etc. So for some easy "tuning" others not. Supply voltage for the memory PHY. The VRM still works, but the CPU now uses an internally generated voltage instead of the external VRM on the MB. So you can change the value, but it won't affect anything inside the CPU. Only the CLDO_VDDP value works. The setting is saved, but you need to power off once first before it actually applies. For example set the value and save + reboot. Go into BIOS again and power off your system, then power on again and the value should be applied. You can try changing the CLDO_VDDP setting (in AMD CBS, don't remember exactly which submenu), it's the replacement for VDDP found under Tweaker's paradise. Our setting is not affecting anything anymore, AMD changed the internal LDO setting. It can help stabalize things and even help with the memory frequency hole. Recommended values are around 900-1000mV, default is 950mV. - In case you run into a MEMCLK hole, adjust the CLDO_VDDP voltage. The VDDP adjustment window is rather narrow, usually < 100mV. Also the window is neither static or linear. Because of that the setting which is optimal for frequency x might not be optimal for frequency y. Also since the window is not linear, but more of a wave form e.g. VDDP at 975mV might work perfectly fine whereas 980mV won't be able to train the memory. The MEMCLK hole is both CPU and DRAM specific, but so far I haven't seen any evidence it being motherboard specimen specific. This means that swapping either the CPU or the memory (to another CPU or modules) might either introduce or the get rid of the MEMCLK hole. Personally I have 100% success rate in clearing the MEMCLK hole with CLDO_VDDP adjustment (1x R7 1700, 1x R7 1800X and 2x R7 1700X). All of the MEMCLK holes on these CPUs have been cleared using 937 - 1000mV setting. Do note that when you change the CLDO_VDDP voltage, saving the bios settings will not put the new CLDO_VDDP voltage into effect, since the CLDOs can only be programmed during a cold reset or a cold boot. Because of that I suggest that you save the new CLDO_VDDP value and press the reset button before the system has booted up again. Also CLDO_VDDP must be at least 100mV lower than the DRAM voltage at all times. Regardless it is not recommended to exceed 1050mV. - For Samsung B-die dual rank modules I suggest that 96Ohm ProcODT is used. The memory controller FW used in 1.0.0.6 still has room for improvements. If the CLDO_VDDP is out of whack then it will fail memory training all together. I've yet to see any kind of improvement in stability from VDDP adjustment. I'm not sure what the programming rules for tCWL are in this specific version, but make sure it is in sync with tCL on dual rank modules. Also if you're running high VDDCR_SoC voltages, try lowering it a bit (< 1.100V). Other than that there is not much you can do about it. CLDO (dLDO) regulators don't use any of the external interfaces as the regulators are built into the die. They have granularity of 1LSB = 1mV, meaning you don't have to follow SVI/2 step size (6.25mV - 12.5mV). If setting Command Rate or Geardown, please note Geardown = Enable is only possible with Command Rate = 1T (default at 2666+). Additionally CAS Latency is required to be an even number when Geardown is Enabled, some of you might have noticed. The default configuration is BankGroupSwap = Enabled, BankGroupSwapAlternative = Disabled. These two options are mutually exclusive, meaning they can both be disabled but they cannot be enabled simultaneously. Disabling BankGroupSwap will improve the real world performance (by couple percent), however the reported bandwidth (e.g. AIDA) decreases by < 6%. Enabling BankGroupSwapAlternative has nearly the same positive effect on the real world performance, while the reported bandwidth remains at the same level with BankGroupSwap = Enabled. Neither of the BankGroupSwap options should be touched, unless 1 DPC SR modules are used. If you are using dual rank or 2 DPC single rank modules, you don't touch these options at all. This results in BankGroupSwap = Enabled and BankGroupSwapAlternative = Disabled (the configuration I was using). With 1 DPC single rank configuration you should either disable both of them, or set BankGroupSwapAlternative = Enabled. Enabling BankGroupSwapAlternative has the same positive effect on the real world performance as disabling BankGroupSwap does, however it doesn't have it's down sides (i.e. the lower reported bandwidth figures). For 2 dimm per channel dual rank leave as is, ie UEFI defaults. For 1 dimm per channel dual rank leave as is, ie UEFI defaults. For 2 dimm per channel single rank leave as is, ie UEFI defaults. Only for 1 dimm per channel single rank set as Disabled for both or have BGSA Enabled. Those who are able to train the memory at high speeds (>=3466MHz), but are unable to stabilize it due to signaling issues, I suggest that you try decreasing the "Command & Address" related drive currents (increasing the resistance). 24.0Ohm is the default value for all of them, at >=2666MHz MEMCLK (regardless of the DRAM configuration). These values are not very sensitive so anything up to 60Ohms should allow you to train the memory. At default settings (24.0Ohms) anything above 3466MHz was unstable due to signaling issues (only B2 DIMM slot was able to run 3600MHz stable). In the past I have used HCI Memtest, then we have Google stressapp test, link to thread. Below is example of what is needed in a batch file to open 16 instances of HCI using 850MB to test ~13,600MB on a 16GB rig. Remove lines for lower thread count CPU and edit value after /t to change RAM amount an instance uses. In the OP of Official AMD Ryzen DDR4 24/7 Memory Stability Thread, there info on using these applications. Another thread that has some good posts to ref/search in is *Official* DDR4 Z170 Z270 and X99 24/7 Memory Stability Thread. This post contains his DDR4 timings setup on F4-3600C15-8TZ @ 3466MHz which I believe to be F4-3600C15D-16GTZ (Samsung B-Die). His timings give a very nice boost . Some members have reported issues with them, so all RAM/CPUs may not accommodate them. For me his timings at 3333MHz eclipse 3466MHz C16 2T which is best I can attain with my CPU for that RAM MHz by keeping to SOC: 1.1V DDR: 1.375V. More timings have also been shared for 3200MHz and 3333MHz in this post. Hynix AFR / MFR 1 DPC SR timings in this post. Above was The Stilt's 3333MHz Fast setup, my F4-3200C14D-16GTZ did need 1.375V set in UEFI, so some may find 1.35V isn't enough. Also see spoiler labeled BankGroupSwap and BankGroupSwapAlt, as BGSA Enabled with timings above is an option to use. Half of the 3DMark Sky Diver Combined Test score comes from the physics score. The physics engine used in 3DMark is Bullet, which is extremely sensitive to latency. These are with R7 clocked at 3.575GHz. Those are five run averages, since the score varies slightly between the runs. 3DMark SD CT isn't the best benchmark to evaluate the real world memory performance, however it is quite decent and can be run very quickly. Higher DFICLK itself doesn't improve the performance. Increasing the DFICLK (by increasing the MEMCLK) only helps if the DFI is the bottle neck. 1600MHz DFICLK (i.e. 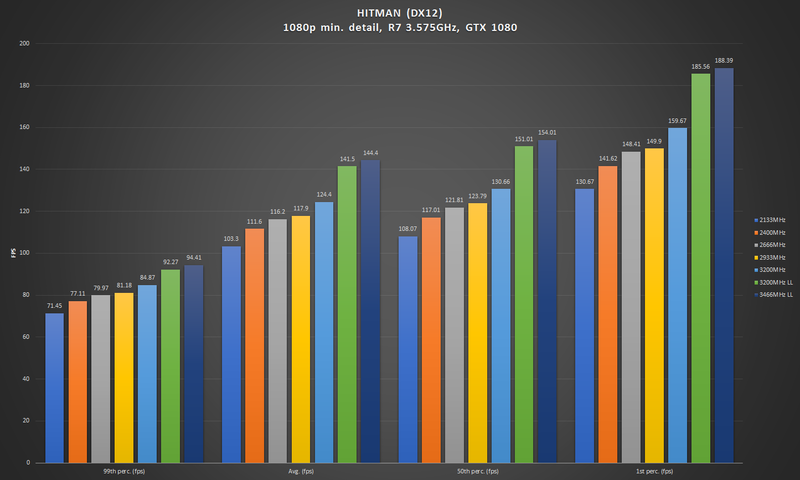 3200MHz MEMCLK) is sufficient for > R7 1800X and the returns from higher speeds are diminishing. At higher CPU speeds (which are unachievable on current gen. Ryzen CPUs) the required DFICLK for optimal performance will increase as well. Latency is king >= 3200MHz. Timings used for 3200LL & 3466LL in above chart are below, 3200LL needed ~≥1.45V, RAM kit used by The Stilt F4-3600C15D-16GTZ. Sure, on 1401 I can stabilize them at 3600MHz but the performance is worse than at < 3066MHz. The new PMU used in 1401 bios is no longer able to handle tight tRDRDSC, tRDRDSCL / tWRWRSCL or 1T command mode with GearDownMode disabled at high speeds (>= 3466MHz). With older PMUs it handled them just fine, however I wasn't able to stabilize 3600MHz in dual channel due to signaling issues (CAD options weren't available). For example at 3466MHz setting just tRDRDSC from 1 to 5 CLKs will result in lower performance in HITMAN than 2933MHz with tRDRDSC at 1 CLK. This is by no means ASUS's fault, it's just the characteristics of the new PMU firmware. In a heavily-multithreaded “all cores boost” scenario, this user-focused performance tuning permits the 1700 to ramp peak power draw up to its fused package power limit of approximately 90W electrical (note: AM4 reference power limit is 128W). Precision Boost and/or XFR will level off at 72.3tCase°C or ~90W of electrical power (whichever comes first). In a heavily-multithreaded “all cores boost” scenario, this user-focused performance tuning permits the 1700X/1800X to ramp peak power draw up to the AMD Socket AM4 reference limit of 128W. Precision Boost and/or XFR will level off at 60tCase°C or 128W of electrical power (whichever comes first). Notes: above is for "out of box" setup, when we up multipler of CPU past x point CPU goes into OC mode, so "headroom" limitations are removed. tCaseMax is the actual maximum package temperature, measured from surface center of the IHS. This figure is significantly lower (IIRC 71-56°C), as it is an external temperature (a major delta is to be expect). - 3.9GHz maximum single core XFR ceiling (SCXFRC). In above slide PState 0 is 3600MHz on the 1800X, that is the base frequency of Precision Boost; then we have the other boost frequencies dependent on other factors of headroom/XFR. XFR is on non X CPU but half that of a X CPU. For example an M.2 drive running at Gen 2 x4 with 140 RECLK will give you 2800MB/s of bandwidth. SATA is not affected, at least the ones which are located in Promontory (external FCH). I'm not certain if Taishan's (internal FCH) SATAs are affected by the BCLK, but there is a chance they are. Quote extract from, but do also take Elmor's findings into account, so YMMV depending on setup, etc. Now let's say we keep stock multipler and adjust BCLK, will PB/XFR function? link. I would also think as CPU has not entered "OC mode" due to keeping stock multipler the limitations for "headroom" will apply as per info in section "Precision Boost and XFR info". There is no such fluctuation, it's 100% a readout problem. Reference clock is not directly measured, but calculated using a suitable counter and prone to errors. The only platform which has hardware counters for reference clock is Skylake/Kaby Lake. Do you have any details on accuracy @Mumak? AMD Ryzen processors do not use pre-programmed VID tables. 1. Therefore, there is no fixed Vcore when the CPU runs in its out-of-box condition. 2. Default Vcore will vary depending on workload and will range from 1.2-1.3625V. 3. Overclocking an AMD Ryzen processor will snap the voltage to 1.3625V, but this value can be changed. As a general guideline: a CPU voltage of 1.35V is acceptable for driving everyday overclocks of the AMD Ryzen processor. Core voltages up to 1.45V are also sustainable, but our models suggest that processor longevity may be affected. Regardless of your voltage, make sure you’re using capable cooling to keep temperatures as low as possible. While there are never guarantees with overclocking, the majority of users should find that an 8C16T AMD Ryzen processor will achieve 4.2 GHz @ 1.45V of CPU voltage. Advanced and accomplished overclockers trying to push record frequencies may find more headroom by disabling cores and disabling SMT on motherboards that offer the option in the BIOS. Just to prove above is official info, please use the link in this post, see page 34. Next info from The Stilt, link. Due to how Ryzen is, owners will see variable voltage and high peaks when PB/XFR occurs. It is confirmed now that using AMD CBS section places CPU in "OC mode" like by just a multiplier change say in another part of mobo UEFI, the post by The Stilt. The ProbeIt read points are on page 32 of user manual, when I have an image of measuring points for socket, it will be placed here. Using DMM to measure voltage will be accurate only in idle. During load you will read higher than what the CPU is actually getting because of power plane droop being accounted for when the VRM outputs voltage. The VRM uses on-die sense outputs to read accurate voltage at the "destination". It will thus output a higher voltage during load because there will be significant voltage drop across the CPU and ground power plane. To get a more accurate reading you need to measure at the MLCCs at the back of the CPU socket, and be sure to also get your ground point from there. All values measured by DMM under full load. Any that I didn't cover in this picture, I didn't have the balls to try to get my probes in there to get a measurement. To read further context to quotes shared within spoilers below, click the green arrow right within quote. Just keep the voltages at sane levels (< 1.45V for VDDCR_CPU, < 1.10V for VDDCR_SoC) and don't tamper with the load-line settings, unless you actually MEASURE significant amounts of droop, under load (which is not likely on C6H). Voltage overshoot hurts just as bad as undershoot, when it comes to stability. If you need to increase the load-line setting (i.e. introduce overshoot) to maintain stability, then your voltages are not set correctly to begin with. I personally recommend to keep the load-line settings at "Auto" at all times, unless you are doing LN2 runs. The main difference between the different Ryzen 7-series SKUs (aside of the clocks) is the leakage. The 1700 SKUs have low leakage characteristics, while both 1700X & 1800X are high(er) leaking silicon. Because of that 1700 requires even less load-line biasing than the other two (due the currents being lower). Because these chips have already been pushed so far at stock, that we're already hitting the voltage limits (rather than the usual thermal or clock limits). Silicon with higher SIDD generally requires less voltage at ISO frequency and has at least somewhat better voltage scaling. They draw more current and run hotter than the silicon with lower leakage, but in case the silicon isn't thermally limited that's not a disadvantage but an advantage. There is a reason why they are binned this way at the factory as well Same was done with Vishera 9k-series CPUs. Using high leakage silicon is most likely the only way to produce 1800X models with their 4.1GHz MSCXFC, without breaching the reliability thresholds for VDDCR_CPU. The significantly tighter droop specification applies only in cases where the dLDO is used. dLDOs are not used for B1 stepping consumer parts, so the load-line specification does not apply. Infact the AM4 load-line specification is looser than it was for AM3+ for example (1.425mOhm vs. 1.3mOhm). Only other thing to add to above is the dLDOs are used by minor domains of Ryzen, this is stated by The Stilt in his Ryzen: Strictly technical thread on Anandtech. Despite the presence of the dLDOs, the consumers can ignore them completely. This is because in the consumer parts most of the dLDOs (all except some of the minor domains) are permanently placed in a by-pass mode. This means that actual regulators are disabled and all of the voltage regulation takes place on the motherboard, just like on the previous generation CPUs and APUs. Other posts to ref of The Stilt, link to post showing how to calculate VDROOP, link to how to calculate overshoot from LLC change, LL tool, ITE granularity, leakage aspect touched on in this post. Just something a bit more objective to help scotch some of the eternal LLC debates. LLC 1 works quite well for everyday use. Just a stock capture here. That said, the CPUs don't pull much current at all, so I don't expect big changes. Small FFT Prime load hitting the VRM. 1.40 VID set in UEFI gives around 1.38V "idle", dipping no more than 20mv when hit with load. There's no need to go through all of them. Not from my perspective, anyway. With an LLC of 5, if VID is set to 1.40V in UEFI (manual), you'll see load voltages in the ballpark of 1.45V. When releasing the load, the voltage will momentarily peak around 1.47V, before it returns to idle state. The overshoot duration is sub 50uS, but the CPU frequently sees 50~70mv more than what you've set. With "Voffset removed" the VRM has to substantially ramp the voltage when the load hits (will vary somewhat depending upon current), which puts more strain on the FETs. It's just more strenuous on the system to have to ramp voltage by ~50mv while dealing with a transient. How that may impact things down the road is always up in the air. You're playing with percentages/potential for failure, and what that means to you. Whether or not it will happen is difficult to quantify. If you have sympathy for electronics, you'd likely opt for LLC 1 or 2. At those levels, peak overshoot is constrained 10-20mV over the user-applied VID at durations that likely fall within the tolerance guidelines. Those levels are complimentary to the associated devices. From levels 3 and above, the actual voltage is ramped above the user-defined value, and we start seeing excursions of 30mV+ past the user-set value. This is where elementary understanding of LLC helps. You just need to set the correct VID to get the required load voltage. Nothing else to it, really. See this post and this earlier one in thread is also good to note. PState 0 in AMD CBS from what I have experienced and others, the VID must remain default. On a R7 1700 this is 1.1875V (VID: 3A), for 1700X/1800X it's 1.35V (VID: 20). So to gain voltage you require for an OC manual or offset mode CPU voltage is needed. Next I change only PState 0 to attain a higher ACB clock and do not modify PState 2 (default 1550MHz), the higher I go for MHz in PState 0 the closer idle clock gets to PState 2 (MHz value). So lets' say I go for PState 0 as 3.7GHz I'll be idling at ~1.5GHz , next I set PState 0 as 3.8GHz I'll be idling at ~1.55GHz, so basically the value in PState 2 is acting as "ceiling" clock for that state and based on how far you OC PState 0 you attain a higher PState 2 clock. If you lower Pstate 2 you get lower idle, I was able to go all the way down to 1125MHz, 1100MHz I'd get random freezes in OS, I had not edited VID in PState 2 for this set of test. Next I edit VID in PState 2, I could use 575mV compared with default 875mV, this approximately changed the idle voltage "range" by ~100mV on DMM readings for VCORE. This meant my idle VCORE range was very close to stock CPU idle VCORE. HWiNFO shows tCTL, this matches AMD Master OC SW, similar to CPU Package MAX temp on Intel. The information on tCTL is contained in this post by The Stilt (Zeppelin=Ryzen). tCTL should no longer be on linearized scale on Zeppelin. AFAIK it is the ROS (alternating, highest sensor reading within the CCXs) in °C scale, similar to AMD K10 cores or GPUs. In my experience the temperatures reported are quite realistic. I'm not fully certain about the retail parts, however the tCTLMax should be 95°C on all SKUs. Zeppelin supports cHTC so the ODMs might be configuring the limit to a lower figure if they want, however the default is 95°C. tCaseMax is the actual maximum package temperature, measured from surface center of the IHS. This figure is significantly lower (IIRC 71-56°C), as it is an external temperature (a major delta is to be expect). Here is also a post by Elmor (do read his job title in his CH6 OC thread ). Below image is from his PDF. Now it is still unclear what is going on with temps, from seeing some of owners posts in the Ryzen club, some members find the need to adjust say tCTL offset in HWiNFO to make it match with AMD Master, others don't. HWiNFO by default has no offset present to tCTL, so this variation must be concluded as down to how mobo UEFI is setup, but I can not say for sure. Sense MI Skew on C6H - To disable or not? Does PLL have abnormal affect on temperature sensors? tl;dr No, not with my HW and OC profile. I am a PC enthusiast with no PC HW/SW qualification and no association with a company in this context. Case has side panel on for testing, as that is how normally rig is used. Room ambient ~25°C, internal setup as shown below. UEFI settings were my usual 3.8/3333 Fast setup. Only PLL was changed from 1.8V to 1.75V and then 1.85V. i) Where do I get the stress test? it is linked in OP of my thread in my signature. ii) Was Sense MI Skew disabled? yes, as I have always done that on all UEFIs as gave me "realistic" temps as I have a R7 1700 with no temp offset. iii) Do you think the temperature data is correct? IMO yes from past experience with HW/SW. iv) What was polling rate in HWiNFO? 1000ms. v) Why is your BCLK 100MHz? I have it manually set as that in UEFI and HWINFO is set to only take a one time reading at launch, so there will be no fluctuation for BCLK. vi) Why is 1.8V PLL test screenie showing a lower min CPU socket temp compared with others? the rig had been powered off for some time prior to testing. I had powered it on and let it idle before testing. I can only assume the variation between that test and later ones is down to case ambient / socket changed slightly via from usage. Between each test the rig was allowed to idle so temperatures at start of 1.75V & 1.85V testing should be relatively "idle" situation. vii) Why test this? there has been much discussion on PLL changes affecting temperature readings. As I had relied on others data in past I thought it was time to test for myself and have another facet testing to compare with a R7 1800X which I will have later this week. viii) Will you be doing testing on R7 1800X? yes. ix) Do I adjust PLL? nope not needed to so far. x) Why adjust it? some have gained stability with it, so I would say a owner needs to decide what they do. xi) What is a safe voltage to use? really no idea, Elmor has touched on it's case usage in the OC PDF in OP, there is a table within his PDF with guidance. What a coincidence Gup , was doing same test on my 1800x. I DO see big difference on Temp readings. No effect on ram voltage readings so far. Did a bench with Cinebench. All same scores. tCTL is getting skewed in your testing, as it did before in several other X CPU owners when this discussion happened before. As tDIE is just tCTL with -20°C and not a real sensor it is also getting skewed. As CPU sensor under heading Asus Crosshair VI Hero is Super IO chip (ITE IT8655E) reading tCTL from CPU it is also skewed. But what your testing shows is what I hypothesized before . CPU socket sensor has no skewing . Note through out your testing it is similar. So the reality is as Ramad posted to Hotstock, the CPU sensors have reading skewed in SW, but actual temperature has not changed with change of PLL. This was also the conclusion in the past reached. Try Sense MI Skew: Disabled when you have time. Pretty sure socket temp is no where near as reliable as tctl, at least in my case. It either reads too high as a min or too low as a high. At idle it reads too high, at low it reads too low lol. For this test case it is useful. For me it can be too high at idle vs tCTL, rationale? a) heat getting trapped in socket, no airflow, etc. b) no cooling solution on that side of CPU so theoretically hotter. Then what about the difference at load between socket and tCTL? well the rationale would be same as TcaseMAX, see section Precision Boost/XFR info in OP of my thread. So to me the behavior of CPU socket sensor makes perfect sense. From this testing I conclude again on X CPU members should use Sense MI Skew: Disabled on UEFI 1401 / 1403 as stated before . Temperature skewing from PLL change is not occurring. CPU socket sensor again is not skewing as in previous testing by yourself. tCTL has the 20°C as AMD state X CPU has. tDIE is correct as it has the offset removed. CPU sensor under Asus Crosshair VI Hero is correct as it has 20°C removed. As this temperature is used for cooling profile, when setting fan profile in UEFI it will be relevant. Min/max tCTL all cases ~46°C / ~80-81°C. Min/max tDIE and CPU sensor all cases ~26°C / 60-61°C. If we use motherboard sensor of ~26°C logically these values are correct, a reflection of ambient temp, IMO down to how majestnl cooling/case setup is. In the 1.86V PLL screenie you have WHEA error chap, "CPU Cache L0 Errors" . In your example (CPU-Z), the CPU + L1/L2/L3 operated at ~4055MHz, while the actual data fabric operated at 1800MHz. Data fabric, memory controller = MEMCLK (effective) / 2. There is no "uncore" in Ryzen. CCX essentially operates at it's own (core speed) and the fabrics and the memory controller at half the effective MEMCLK speed. Uncore is just the term used by CPU-Z for data fabric (DFICLK). Y-Cruncher, this for me runs ~5 warmer than x264, this also is more stressful than RealBench IMO. I do Y-Cruncer 1st, without FFT as temps don't increase much for that so I reckon no use on Ryzen. 2nd x264, 3rd RealBench Stress mode and then [email protected] is also a productive stress test IMO. x264 on my sample of Ryzen needs more VCORE to be stable than RealBench Stress mode. OC also falls over quicker than RealBench. For example RB ST 2hrs pass on 3.7GHz @ 1.1875V but x264 it didn't even pass 1 loop, needed 1.206V. x264/x265 download in this post by JackCY. RealBench, stated by 8 Pack, used by Silicon Lottery for binning. This page right at the top is latest version, v2.54. IBT AVX found in OP of Vishera Owners thread. 1. USB driver link/DISM guide by The Stilt. 2. Guide on using NTLite to integrate drivers at Fernando's Win-RAID Forum. 3. Video of me using NTLite to integrate USB driver to Win 7 Pro x64. i) Win 7 Pro x64 ISO, this did not have "to date" updates integrated but only the USB drivers. ii) After OS install, I installed the AM4 chipset drivers from AMD site. iii) WiFi card's driver, GC-WB867D-I, I use Intel driver from Intel site and not Gigabyte. vi) Crimson driver for Fury X, then ICC profile for monitor. And no "unknown" devices in device manager . I have onboard LAN disabled as don't use it, that does require driver. Onboard sound was picked up, but that will be disabled later as use the GPU's audio output over DP to monitor, then plug my headphones in to it. So far very smooth install of OS and a few less drivers than my i5/Z97 setup . Like how the AMD AM4 driver had SMBus, etc as "all in one" package . Keeping "bloatware" at bay so far . The registry edit in this post by JackCY has info on enabling editable core parking in Win 10. This thread has information on doing the same on Win 7. Above setup with an OC via AMD CBS (PState 0) is down volting / clocking for me. For me High Performance power plan with Core Parking off (ie 100%) on Win 7 Pro x64 gives best performance on 3DM FS, here are 3 runs of each. Balanced Core Parking default 10% (ie enabled). i) UEFI filename as C6H.CAP, copy to USB stick. When using UEFI PState 0 OC with offset mode voltage for VCORE, disable Core Performance Boost on Extreme Tweaker page, there is no need to set the one in AMD CBS menu as that will reset on a memory training fail boot (Q-Code: F9), resulting in possible over volting of CPU, see info at top of OP. i) Use Global C-States Control: [Enabled] located in Advanced page > AMD CBS > Zen Common Options. - Did not matter which USB port I used, I just picked random one on rear IO, USB stick FAT32 (same stick I use for USB Flashback). - After you press CTRL + F2 the entry box for filename is already highlighted, denoted by turquoise / light blue green highlight around it. - Pressing tab / arrow keys / using mouse, entry box can be selected if it is not. - Whatever filename you enter it will have _setting.txt added to it on save. - txt will be saved in root of USB stick. Note: AMD CBS sections are not recorded in settings save txt, I use F12 to grab UEFI screenshots. When looking at the software reported voltage figures sourced from the ITE8665 LPC/IO, keep in mind that the granularity (ADC LSB) isn't very good either. ITE8665E supports 10.9mV granularity (i.e. minimum change, LSB) however because ASUS uses 1:2 voltage divider for VIN1 input (VDDCR_CPU) the actual granularity is twice of the nominal (21.8mV). 2. In the command prompt type "powercfg /import ""
So far none of the UEFIs have had an option, so use bcdedit in OS from command prompt/powershell. Do I need to use both EPS12V 8 pin and ATX12V 4 pin connectors for power on C6H? link. Will XMP work on AM4 board? X370 ASRock Gaming K4 Fatal1ty Review - Good Price Performer?, has option not functioning currently, perhaps in a later release. On Asus mobo D.O.C.P, that video is from 2012 . Gigabyte X370 Gaming 5 has XMP option. Don't know how many/which AMD AM4 mobos have XMP translation feature though. Will mobo's without BCLK clock gen chip support adjustment? link and also link. What about Ryzen's gaming performance issue? link to post. Does HWiNFO report CPU power correctly? to be verified by The Stilt, do read this linked post. Which cores are SMT (HT) in windows? odd, link to post. FCLK, UCLK, link to post, another post on UCLK. Does AMD Master OC SW work with all mobos? will not work on mobos with chipset that lack OC support, see table in this THG article. Gaining RAM IC information, view video. 3x 3DM FS 3200MHz from several days ago. 3x 3DM FS 2133MHz run today. i5 4690K from 250+ Fury X 3DM benches thread, will get R7/X370 on Win 10 soon and use same driver as that thread . Rerun of 3x 3DM FS 3200MHz . Saves files for 3200MHz below. All I do is change RAM strap in UEFI, RAM timings are manually set so the same used (14-14-14-14-34-1T), Asus MG279Q has FreeSync disabled in OSD, using 144Hz. 3x 3DM FS 2133MHz rerun, save files below. So out of 6 results of 2133MHz, total score for run worst vs best. So out of 6 results of 3200MHz, total score for run worst vs best. Then worst 2133MHz vs worst 3200MHz. Then best 2133MHz vs best 3200MHz. CB15 Performance bias enabled in UEFI. 3200MHz without CB15 PB 6x runs from above. 3200MHz with CB15 PB 6x runs. So worst of each compared, best of each compared. 3.8GHz 3200MHz C14 1T, seems more consistent results than 3DM13, but am using v17.4.3 WHQL drivers vs v16.12.2 WHQL, may repeat testing with older driver and other RAM clocks. R7/X370 vs i5/Z97, similar ~3% difference on R7 vs i5 as 3DM13 FSE results for Graphics test elements. Win 7 Pro x64, all updates to date, ISO/install as in section Windows 7 on Ryzen, Power Plan as highlighted in OP relevant section. UEFI is set pretty much manually, so when I was lowering straps only what I can't control has changed. Win 10 Pro x64 Creators Edition, clean ISO install, all updates to date. UEFI is set pretty much manually, so when I was lowering straps only what I can't control has changed. Power Plan is default Balanced with Core Parking 50%, this has been used as it seemed most "Optimal" for 3DM FS/TS. Then also the 3.8GHz OC I run for 24/7 use, when compared with W7 High Performance Core Parking 100& (ie disabled) vs W10C for CB R15 was ~3 points within each other. The 1703 result for CB15 in screenies is a saved result on W7 with no PB in UEFI with 3200MHz C14 1T. More RAM clocks to added soon, so check back. Location: In the gutter but looking at the stars. OMG Arne! that mainstream system has got you on a mainstream forum! Yep will add that to OP , also got a few other tweaks to do to OP today . Heh...actually I already got rid of that mainstream system...didn't quite cut it for me...thinking of trying Ryzen out...so appreciate the thread! Nice to have you guys onboard . Storage capability is lacking on X370 vs say X99 from what I have seen others state. As X370 has enough for what I need I've not looked too much into it. Got some images which later I will place in OP. Yeah OC headroom is sucking on Ryzen. Platform is immature and pretty much all are having "teething" issues. So it will be a rough ride for some time, but I do believe it will be OK as time goes on. Seems like major "bang for $" though vs an Intel 8C setup TBH, that's what made me jump. This was an interesting watch posted by a member in owners club. Hoping to ask someone who has more knowledge (aka The Stilt if the video is on the ball and will add to OP). Cheers mate , more the merrier . Gonna add this link to OIP soon and perhaps guide of me updating a Win 7 ISO . Created Win 7 x64 SP1 ISO with Ryzen USB/chipset drivers today, integrated using nLite v1.3 following Win RAID guide. Hopefully my CH6 be here tomorrow and once installed and verified can share my screenies of ISO creation.